If you need an oil change in Coppell, Tx 75019, visit City Garage Coppell for all your oil change needs. $29 Green Oil Change – Includes up to 5 quarts of Valvoline NextGen multi viscosity motor oil made with recycled content, new oil filter and lube chassis. Diesels and luxury imports cost more. $59 Full Synthetic oil, lube & filter Change – Includes up to 5 quarts of Valvoline Full Synthetic oil, new oil filter and lube chassis. Diesels and luxury imports cost more. $29 Standard Multi-Viscosity oil, lube & filter change – Includes up to 5 quarts of Valvoline oil, new oil filter and lube chassis. Diesels and luxury imports cost more. 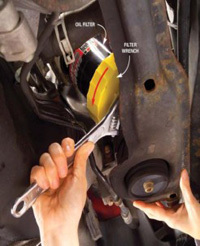 We also offer a synthetic oil change coupon and premuim oil change coupons to assist you in this tough economy. 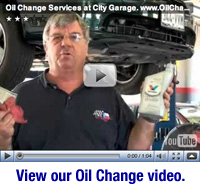 Click here for oil change coupons that you can use on your next visit to City Garage Coppell. Why change oil frequently when not due by mileage? Vehicles routinely driven short distances, especially in cold weather will build up moisture in the oil from condensation and combustion gases by-passing the rings. This build up of water will cause acids to be created within the oil resulting in the formulation of sludge and accelerated wear. There are additives in the oil, which are designed to combat these acids, but they deplete over time, and can only control so much moisture. It can be worse to drive 2,000 miles in the winter of short trip driving in six months before changing oil than six or seven thousand in the same period. Oil viscosity can make a big difference when it comes to getting lubrication to the furthest parts from the oil pump, which is usually the valve train. Besides improving gas mileage, if it gets near or below freezing where you live you should definitely be using a 5w-30 oil.